The AMG500 Convertible Hand Truck/Platform Cart from Krane is a versatile tool for moving heavy loads – use it as a hand truck or convert it to a platform cart, and fold it up for easy storage when you're done. Made of carbon steel 8" no-flat wheels and 4" swivel casters, the 500 lb capacity cart comes with integrated stair climbers that help greatly when navigating staircases or curbs. The fork of the hand truck serves as an end rail on the platform cart, but can also fold out of the way for a more open configuration. When not in use, the cart folds down small enough to fit in a typical car trunk, and stows easily at home or work. Box Dimensions (LxWxH) 27.0 x 16.4 x 7.4"
AMG500 Convertible Hand Truck/Platform Cart is rated 4.8 out of 5 by 6. Rated 5 out of 5 by bakum from Solid little cart This cart is exactly what I wanted. It's small, very flexible, easy to use and adjust, and performs it's primary duty (being a cart) just great. It's stable, the wheels are big enough to make it stable. Changing configuration is a snap. And it's very small, so it stashes in smaller places than most carts that do what it does and carry the loads this one carries. Negatives are that it's pretty heavy, which I guess makes sense given that it will haul around 500lbs. It needs to be solid! But my wife has a little trouble with it, getting it into the car, getting it up and down stairs, that sort of thing. One other negative is the the tube construction means the bed and the fork aren't good as is for hauling things that don't have a flat side. Oddly shaped gear or loose items wouldn't be stable. I purchased the puzzle deck and the fork deck accessories to make a flat surface for just this issue and they work great. Rated 4 out of 5 by Debra from Sturdy, well-built cart Easy to assemble despite instructions were not very clear. ?Easy to operate and convert from hand trick to platform cart. Solidly built; however, this version is not as long as I would have liked in cart form but the platform provides additional space. ?Definitely recommend purchasing the puzzle decks for the platform to assist in carrying odd-shaped items. Disappointed that the puzzle decks are not included with the cart based on the price. Easy to fold and transport; relatively light for its size. The wheels are solid and do not require air which allows for easy maneuvering over gravel, wood floor, concrete and carpets. Rated 5 out of 5 by Mark C from This is a well designed well constructed moving device I just purchased the AMG 500 from B&H and I am delighted with the product. Here are a few comments, however, which may be helpful: The assembly URL:?kranecarts.com/amg500/assembly?does not work. I could not open this from any of the browsers that I use. The two frame parts that must be aligned for the axle to be inserted were very difficult to put together. I needed to coax them to align with a wooden block and hammer. The central frame component is filled with cardboard packing which is not easy to remove. I forced these cardboard bits out when I inserted the axle. The assembly ?instructions should note this. Intuitively I would have thought that the deck adjustment mechanism ?would have locked the frame when it is in the 2 wheel hand truck position but close examination of your promotional video reveals that the velcro strap does this. I’m curious as to why the adjustment mechanism doesn’t do this? The product instructions should be clearer on this. These are not complaints - just comments - as I'm quite taken with this product and have now used it several times and it performs excellently. Rated 5 out of 5 by Full-Time Musician from Saving a trip to the chiropractor This cart is well thought out in terms of its use and practicality. I should have purchased it a couple of years ago...so says my shoulders. Rated 5 out of 5 by Cooper from They only thing better than the AMG500 is my new AMG750! Love the Krane products ended up buying the full line of stuff. Rated 5 out of 5 by Robert from Solid cart and worth the price The Krane AMG500 is a very well-designed cart and the manufacturer claims that it's strong enough to handle 500 pounds. I haven't tested the weight limit but it seems very durable. The tubular steel is lightweight but very tough. I bought the Puzzle Deck add-on so I could easily load it up with camera bags and lighting gear. The add-on deck is necessary and I'm thinking of getting the Fork Deck also. 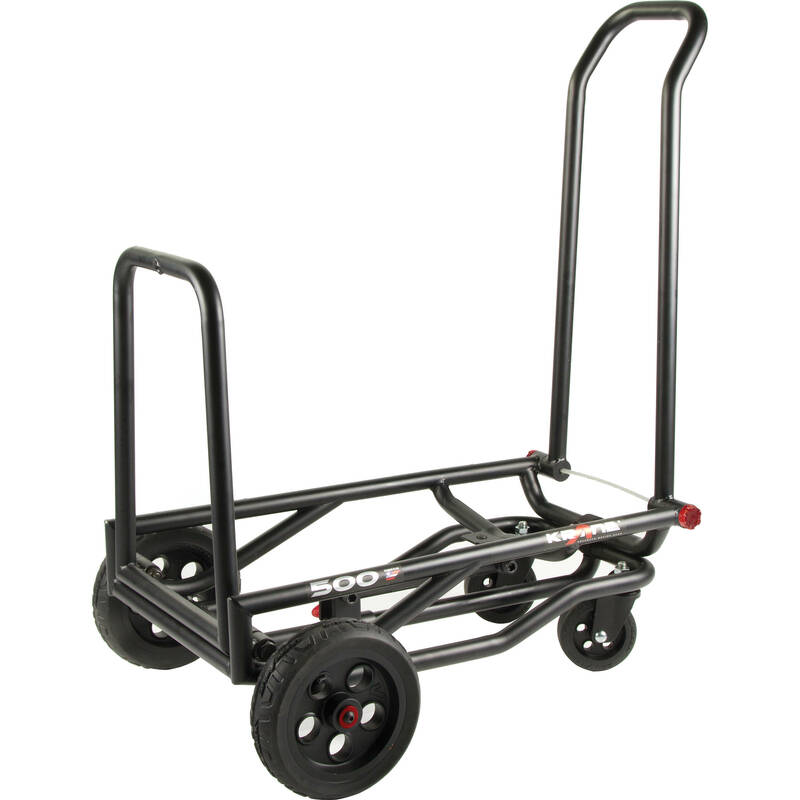 This cart glides effortlessly on smooth or paved surfaces. But I have also used it on gravel paths and grassy areas and the smaller wheels in the front aren't really designed for that. It still rolls perfectly fine -just takes more muscle to pull it. I kind of wish Krane made a model with four large, all-terrain wheels since I shoot outside a lot. The best feature of this cart is the ability to easily configure it into several useful positions, depending on your needs. I would definitely suggest getting the Puzzle Deck along with it. I think Krane should have included the Deck, considering the price. It's just a rigid board with carpeting on it. I'm also thinking about getting one of the cargo bags too. The cart comes mostly assembled and all you have to do is attach the axle and wheels. Assembly is simple and takes five minutes. I highly recommend the AMG500. Krane makes a solid product and I'm looking forward to seeing what they come up with for future product designs. In its &quot;U&quot; shape configuration how high is the handle on the tallest side from the ground? According to Krane Carts, the measurement of the KRANE AMG500 Convertible Hand Truck/Platform Cart from the ground to the top of the tallest handle is about 34&quot; (0.86 m) in height. Does anyone know how this compares to the Rock-N-Roller carts in terms of quality and support? MultiCart and Krane are two of the most popular convertible folding carts that we carry. Both brands are known for their incredible build quality and design. The main difference is in the number of offerings each brand has, as Krane only has three (3) cart options (while we only carry two of the options), compared to the 17 options we carry from MultiCart. However, the MultiCart and Krane carts are the two best sellers in this category.